Exciting to receive my first disc from the new Avie label � long may it flourish! 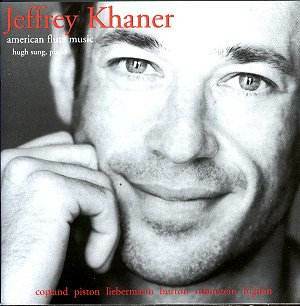 This is a highly enjoyable collection of flute music by twentieth century American composers, performed by the Canadian flautist (or �flutist� to use the transatlantic terminology) Jeffrey Khaner, accompanied by the pianist, Hugh Sung. Jeffrey Khaner is the principal flute of the Philadelphia orchestra. Khaner has put together a delightful collection, though it�s possible to argue that the pieces here are a little too stylistically similar � certainly on first hearing there is a certain sameness, though the playing offsets that. But in any case, on repeated listenings, the individual characteristics of each work and its composer came over very strongly, and confirmed that this is an intensely enjoyable disc. The Burton makes an ideal starter; it�s an unpretentious and gentle work, with obvious French influences, Ravel being the most obvious. The writing for the flute is wholly idiomatic, and explores its various registers with great resource. It proceeds from the thoughtful first movement via a mournful Andantino sognando (sognando means �sobbing�) through to a lively and brilliant finale. Copland is the best-known composer represented here, and this Duo is one of the very last works he composed before he began to suffer from the Altzheimer�s that blighted the remainder of his days. It is a lovely little piece, with strange distant echoes, it seemed to me, of some of his earlier music � Fanfare for the Common Man is hinted at early on, as are Appalachian Spring and the 3rd Symphony. Walter Piston�s Sonata of 1930 is the earliest piece on the disc, and also, interestingly, the most complex one. It�s a powerful work, with a certain uneasiness in the harmony and the equivocal march/jazz rhythms that invade the first movement. The Beryl Rubinstein (�Beryl� by the way was a male composer who born in Athens, Georgia, USA) is the perfect foil, a charming, wittily faux-naïve work. The influence of Les Six is clearly present, Poulenc in particular, but Rubinstein has his own delightful personality. This is the most obviously attractive work in the collection, and it�s my guess that a few flautists will be taking it up in the next year or two � I hope so! The two concluding pieces, by Lowell Liebermann and Jennifer Higdon, are much more recent, but no less pleasing and worthwhile than the others. The Liebermann is in just two strongly contrasting movements � a pensive and expressive Lento followed by a brilliant and slightly frenetic Presto � while the Higdon is a more impressionistic work, with elusive yet very beautiful melodic contours. Throughout all this music, much of which is technically of extreme difficulty, Khaner�s playing is faultless; his finger-and-tongue work is dauntingly brilliant, while he phrases with the utmost sensitivity and controls all parts of the flute�s register with equal ease. There may be those who will find his tone a little too sweet, with its strongly throbbing vibrato and great sweetness � but all those who know their onions where the flute is concerned will acknowledge a major player. He is ably supported and partnered in this splendid recording by Hugh Sung. Bravo Avie!